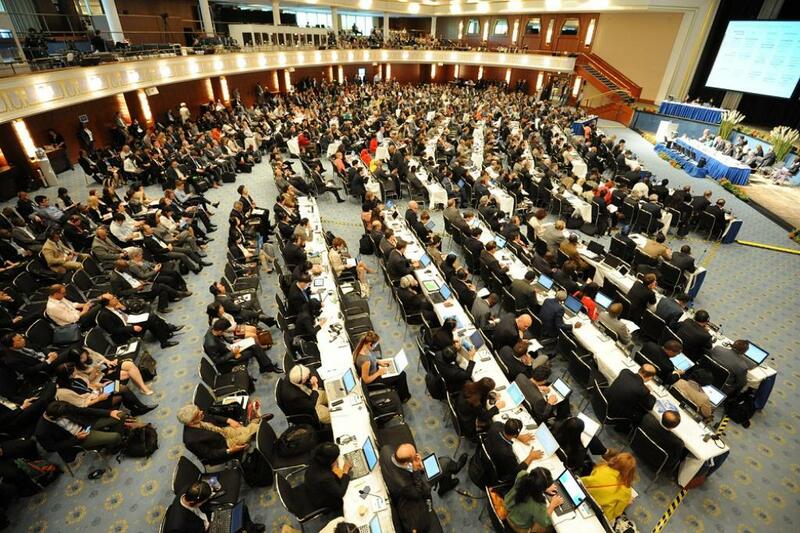 “As far as we are concerned, COP stands for Climate outlasts Presidents,” said US Senator Ed Markey as he addressed a press conference on the sidelines of the climate change summit being held in Bonn. Five Democratic senators from the US came out in a show of support for the Paris Agreement here today. They are part of a parallel delegation of the US under the aegis of “Still In” made up of dissenting senators, governors, mayors and members of the civil society, which, over the past week, has been trying to reassure the rest of the world assembled in Germany for CoP23 that the American people still support the Paris accord to limit global warming to well under two degrees Celsius. “We are still in. There is no question about it. One person does not speak for the entire federal government. We believe President Trump’s statement to be detrimental to American and global interests and security. We are here to reassure the world that we will live up to our commitments,” emphasised Senator Cardin, kicking off the press interaction in Bonn. “Trump is isolated in the world and in the US and American law obligates work on climate change to safeguard American futures,” said Senator Sheldon Whitehouse of Rhode Island hinting at legal action against the current administration in the event of failure to act on environmental protection and climate change. The senators harped on grassroots actions in the US in the wake of Trump’s announcement of the intention to pull the US out of the historic accord. “Grassroots America is committed to fulfilling the obligations and several states across the country are leading by example. The local action in all sectors from energy to infrastructure and transport has been overwhelming,” said senator Markey. Hawaiian senator Brian Schatz asserted that climate action riding on dropping prices of renewables was the “future” and was “unstoppable”. By the senators’ own admission during the presser, fossil fuel interests in the country had slowed down the transition to low-emission alternatives in energy through front groups that had been lobbying for policies and decisions favourable to fossil fuel industry. “We have seen that the fossil fuel industry has deployed front groups and lobbyists to push through policies that run completely antithetical to the stance made in public regarding climate change and the contribution of fossil fuels to it,” exclaimed Whitehouse. Despite the confidence portrayed by the senators, it is fairly clear that dissenters in the US face an uphill battle in meeting all the obligations made by previous administrations without the support of the current one. One of the key areas where it would be evident is the financial commitment made by the Obama administration. Donald Trump mentioned Green Climate Fund as a drain on the American economy in his withdrawal speech on June 1 and has proposed deep cuts in the budget for aid to be sent overseas to help tackle climate change in vulnerable countries. “Financing is a problem but we have been exploring other avenues to step up soft loans and lines of credit overseas,” said Senator Cardin. Senator Schatz admitted that financial commitments were not likely to be met on time in light of Trump’s cuts. While the group claimed that it had bipartisan support on several issues, including transition to renewables, the panel had no Republican representatives to back this claim. The parallel delegation is separate from the 48-member official delegation from the US, which has been at the table at key meetings and negotiations on the Paris Agreement despite the announcement of withdrawal made by Trump. While the involvement of the official delegation has been cautiously viewed as something that cannot be compromised on to ensure the possibility of the US rejoining at a later date, reports have also emerged that American delegates have been working behind the scenes to object to the push for pre-2020 actions and obstructing the advancement of the agenda for repatriations to developing and vulnerable countries for Loss and Damages due to climate change. The senators, for their part, refused to comment specifically on the negotiating team present in Bonn, claiming no knowledge of the same and downplaying any obstructionist role that the negotiating team was pursuing. In fact, the senators expressed belief that the continuance of a negotiating role for the US was good for the country and the world despite negotiators representing precisely the same things that the senators seem to be up against. “I can’t claim to know anything about any obstructionism by American negotiators but we do believe that maintaining trust and working with the world now is a greater challenge in light of the President’s comments,” said senator Cardin. Questions to American negotiators about the US’ stance on climate change have been met with almost adversarial silence. Although the senators seem to have made the right noises, it remains to be seen whether there is any substance behind the noise or whether the senators are simply using the stage to politick against their President.